Helping the little girl in all of us realize our dreams! We invite you to come to our farm open house Saturday, TBD from 9 AM to 5 PM and meet these amazing horses in person! Meet the horses and the family of Flynt Hylls Gypsy Horses. Learn about the breed and what makes them so special! We are hosting an open house and inviting everyone to come and help us celebrate 13 years of breeding, raising, showing, and working with these beautiful horses. 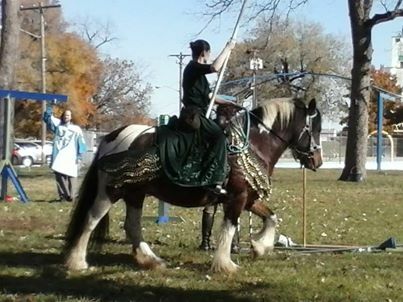 Flynt Hylls Gypsy Horses is celebrating THIRTEEN YEARS of involvement with these beautiful and majestic horses. We could not imagine our lives without them, and are working on expanding our farm and operations. Watch our website for updates and details. It takes a champion horse to make a champion team! 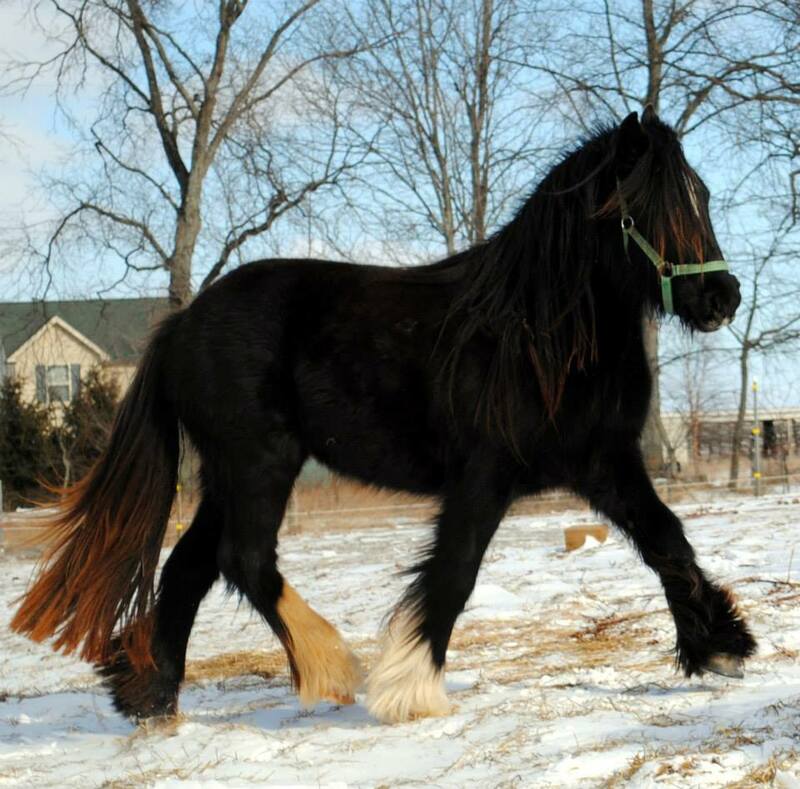 Flynt Hylls Gypsy Horses continues to be committed to breeding a true proper and TRADITIONAL cob or vanner (as they are more commonly known in the US). You won't find "the latest fad or fashion horse" on our farm, just true to type tradition. Flynn is the basis of our breeding program, and a champion he is! 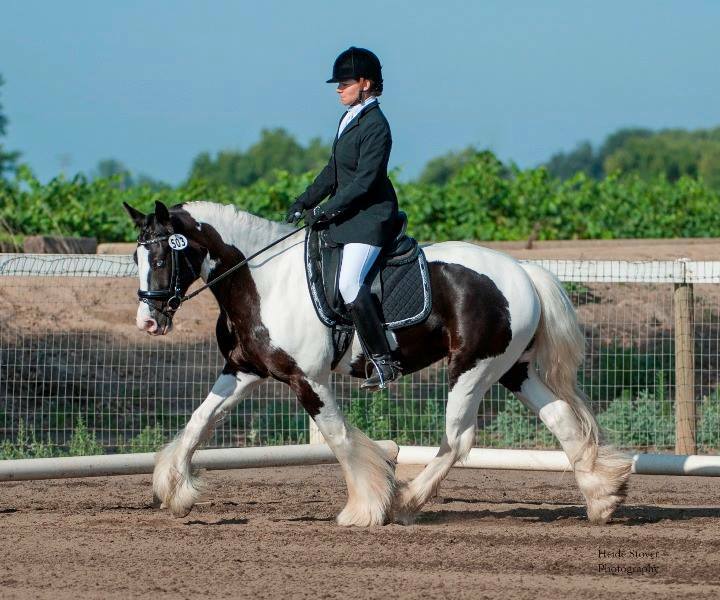 Flynn has numerous show ring wins to his name including SEVERAL Champion Stallion and Supreme Grand Champion Gypsy Vanner/Horse. He has been a superb choice as a herd sire. Flynn continues to be one of the broadest, best boned Gypsies in the US. He has proven himself an amazing horse, competing and winning in all competitions; halter, driving, western pleasure, dressage, even race events! I couldn't imagine a better choice for a stallion. Flynn is DNA confirmed bloodlines to include Watson's Old Horse AKA Lad, and the Producer. Our mares have a nice range of size and abilities. Fee Bee and Glory are bigger boned and shorter; the more traditional body types. Fee Bee is proving herself in her own rite as a performance horse, doing very well in halter and saddle classes. She is a very bold and forward mare, and one of the most affectionate we own. Fee Bee stands 14.1 hands and has more mane than I've seen on any mare. Glory came to us in the summer of 2014. She is a daughter of Syd's Good Stallion aka the Frainey Horse; good "old" bloodlines. She has been a broodmare all her life, but is a very sweet, quiet girl. She stands her ground around the other mares, but she doesn't cause trouble. And she is great with the other babies. Glory stands 13.2 hands with abundant hair. Flash is an older mare and the herd matriarch. She stays on the farm and makes babies, but she enjoys her one-on-one time and grooming sessions. Her babies from Flynn have been some of the best put on the ground anywhere, and they seem to be getting better every year. Per DNA comparisons, Flash appears to be from the Lion King and Rose bloodlines. Wow!!! Tribecca is a bit more feminine but still a very nice, proper mare. 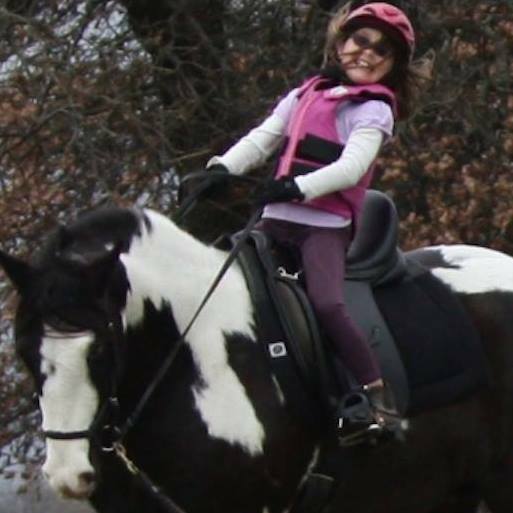 To her credit, Becca is currently being used as a Dressage lesson horse by a local barn. They borrowed her for a week long camp and fell in love with her! Tribecca has one of the prettiest heads and softest eye I've seen on a Gypsy and she passes this on to all of her foals. We have tried to do DNA searches for her lineage and keep coming up short. Her closest DNA match is with a mare in France. While we may not know much of her bloodlines, what we do know is it is rare, which means you won't be "accidentally" inbreeding with any of Tribecca's offspring! Serenity (Saoirse X Flash of Gold), a very flashy red and white mare, comes to us from our friends at TNT Gypsy farms. She is the traditional size, about 14.2 hands, and very easy going. Serenity is going well under saddle and we hope to train her to drive as well. 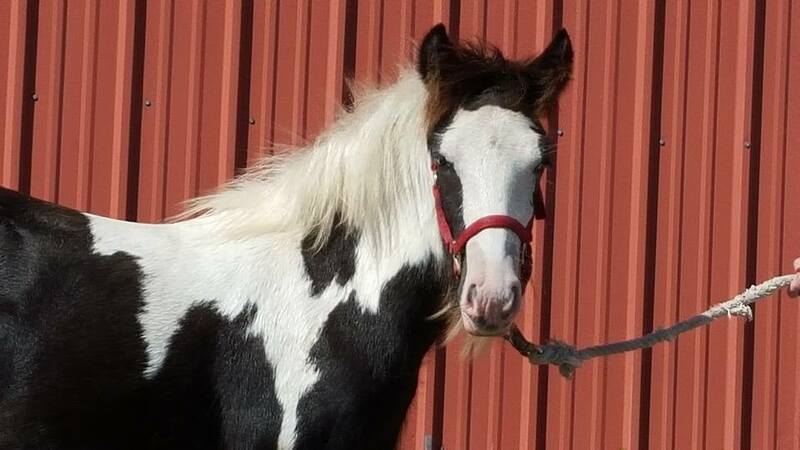 Emma Peel comes to us from our friends at Bandera Gypsy Horses in Florida. She is a big, solid mare with a beautiful, delicate head. Her babies by Flynn should be HUGE! Emma has been bred to Flynn for a May 2017 foal. This one should be extra beautiful! Avondale is a daughter of Emma Peel x SD Cotton Eyed Joe, grandaughter of SD Wooly Mammoth. At just over two years old she is HUGE and sweet, sweet, sweet! She has her mother's beautiful face. When old enough she will be put under saddle, then later put into the breeding program as well. With her bloodlines she should produce some amazing babies! Brandywine represents our breeding program coming full circle. 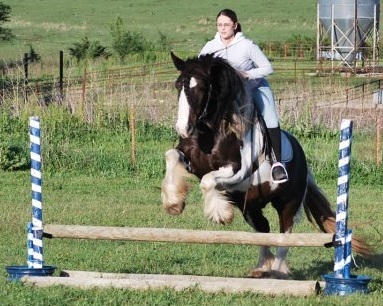 A granddaughter of Tribecca x Flynn and sired by the well known Ainsley, Brandy has come to Kansas to rejoin her roots. We'e searched across the US and have found very few farms that breed what we are looking for. It was a blessing to be able to bring back one of our own lineage. Mama Mia comes to us in 2017 from our friends at Gypsy Lane Farms. A Granddaughter of the amazing British Sterling, she has amazing conformation and is expected to finish at about 15 hands. She is beautiful and built right! Flynt Hylls Gypsy Dark Superstitions is a product of our own breeding program. 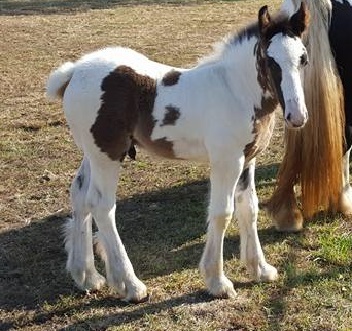 He is an amazing and flashy colt, following our goals of breeding a true proper Gypsy Cob type horse. We are excited to watch him mature and develop into a stallion as amazing as his father. D.S's first foal was born early September, a colt name Shiloh who will be going to Kim in Balltown, IA. RGR Super Nova of Flynt Hylls is our newest boy, coming from Run Gyspy Run farms in Michigan. He is bay and white with two blue eyes! Quiet, HUGE and hairy!. We looking forward to watching Nova mature and placing him into our breeding program when he comes of age. We are very pleased to boast a well-rounded herd of the highest quality Gypsy Cobs/Vanners, with a great selection of off-spring. We are sure you will find exactly what you are looking for. And, if we don't have it, we'll go to our nation-wide network of fellow Gypsy owners and breeders to help you find exactly what you are looking for. If you are ever in the beautiful midwest plains, please stop by for a visit.